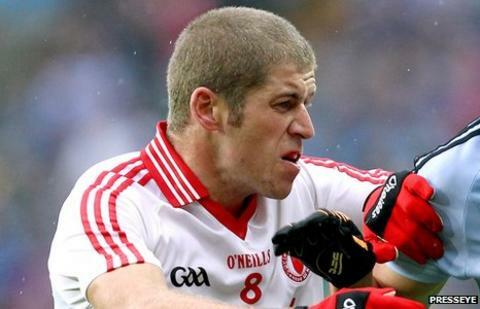 Kevin Hughes has become the latest Tyrone football veteran to retire from the intercounty scene. Hughes recently became a father for the first time and appears to have decided that he is unable to give the necessary commitment to the squad. The Killeeshil clubman was man of the match in Tyrone's inaugural All-Ireland triumph in 2003 against Armagh. Brian Dooher, Philip Jordan, Enda McGinley, Brian McGuigan and Ciaran Gourley have also retired recently. Manager Mickey Harte could not be reached for comment but a number of Tyrone sources confirmed to BBC Sport that Hughes, who will be 32 in March, had opted to retire. Philip Jordan also Tweeted a tribute to Hughes' Tyrone career. "Hearing Hub (Hughes) has hung up the boots. A great career, saved his best for the big days - '03 and '08 finals. On top of that, a great fellow," said Jordan. After his remarkable midfield performance in the 2003 All-Ireland decider, Hughes was not part of the squad for the 2005 triumph over Kerry. However, he returned to help Tyrone clinch the 2008 Sam Maguire Cup against the Kingdom and has remained an important member of the Red Hand panel since then.